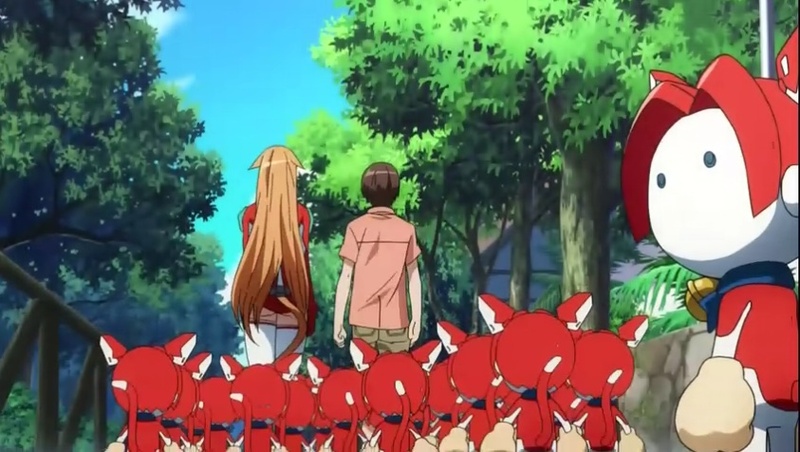 I Blog Anime: Asobi ni Iku yo: Um, Reality Check? Asobi ni Iku yo: Um, Reality Check? Ok, I know this kind of wacky fiction would have some kind of detachment from reality, but most animes that are similar in concept usually have at least one character that is aware of surrounding reality when everybody else is oblivious about it. In Asobi ni Iku yo however, it seems that not only every single character is oblivious about the surrounding environment, the surrounding environments (for example, people on the street) are equally oblivious about them as well--wouldn't any normal earthling people be at least a bit curious when they see a girl with cat ear and tail walks around the street with hundreds of small robots following her? Put that aside, however, despite this slight difficulty to wrap my head around this "anomaly", the story is actually somewhat enjoyable. I think it's due to the fact while you are watching it, the detachment of reality tend to makes you somewhat ignore the conventional thinking, which in turn will give you more freedom to explore the concept the story writer actually tries to push through. Come to think of it, it is quite a brilliant setup, if that is indeed what they intended. At the moment, what I am concerning about, is that it seems to be rolling a bit faster than I was expecting. My original thought that the crossfire of all the different faction making up the majority of the story is highly unlikely to happen now. I'm actually not sure where it's heading at the moment. I guess we'll have to watch and see. Kuroshitsuji II: When is this? [New July 2010] Asobi ni Iku yo! [Ended] Arakawa Under the Bridge: Huh?